My paintings deal with both process and symbolism as they relate to a cathartic experience of making. I attempt to represent different stages of healing metaphorically using landscape, weather, and natural symbols. I find imagery, narrative, and composition physically, through the process of working. Through materiality, I strive to create tension between lightness and heaviness, and lightness and darkness, because I see all of these elements as only being able to exist relative to the others. Working in collage, using a finite number of ripped and cut pieces of paper keeps me both physically and intellectually engaged in trying to solve the problem of how they fit together. In arranging and rearranging the pieces, I find the image eventually in my mind’s eye. I grew up on the south shore of Massachusetts in a coastal town. As a kid, I spent countless hours outdoors exploring the marsh and wetlands at the end of my street. It is a place I still return to often when I need space to reflect, and to this day I remain transfixed with the gentle yet unstoppable forces in nature: weather, the tides, and regeneration of the ecosystem. I draw upon my relationship with this place as a major source of inspiration for my paintings. I draw particular inspiration from the resilience of this ecosystem and the organisms that occupy it in the aftermath of relentless winters and powerful storms. I like to think that there is a connection between myself, these creatures, and the regenerative quality of this place. I began making art in the aftermath of a traumatic brain injury, and this experience combined with the respect I had been fostering for the endurance I observed in nature have come to majorly shape my worldview in ways it has taken me years to understand. These experiences set me on a path searching for meaning in my surroundings and in ways of making. According to the author Andrew Solomon, “Endurance can be the entryway of forging meaning. After you forge meaning, you need to incorporate that meaning to a new identity, you need to take the traumas and make them part of who you’ve come to be, and you need to fold the worst events of your life into a narrative of triumph, evincing a better self in response to things that hurt.” In order to process the difficult and traumatic events in my life, I needed to find a way to forge the narrative of triumph he was talking about. For a long time, I refused to even remotely confront these things in my work because it would have been too close to home, and I also struggled to find a way of working to explore these ideas without being too literal. My experience with trauma also got me thinking about the relationship of the body to art making in a serious way. It wasn’t until my perceptual systems and physical capabilities were severely limited that I had a point of reference to reflect on how critical each of these things are to art making in particular, and how critical they are to maintaining a sense of vitality both in the studio and in life outside of it. Because of this, I am especially drawn to ways of making that exercise this vitality through motion and the physical engagement of working, which is why large scale painting and collage have been so fulfilling for me. 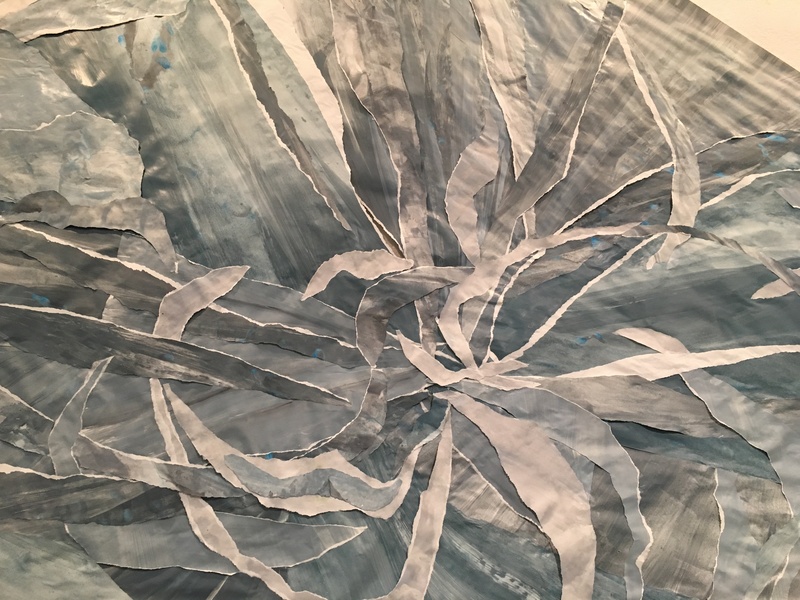 The collage process is at once a personal expression of vitality and also in support of the themes of resilience, resurgence, and healing I seek to explore on a conceptual and symbolic level. I use the language of ripped and cut painted pieces of paper to convey a sense of movement, speed, and construction while adding emotional quality to the paintings. Sometimes they remain very abstract, and other times I bring them to a place of very specific realization recalling unique moments the salt marsh landscape that I look to as pillars of the strength and resilience that exist all around us in nature. In the time I have been developing this visual language and this work, I have mainly been looking at the works of Charles Burchfield and Cullen Washington Jr. as sources of inspiration in contemporary art. The way Burchfield was able to paint “emotional landscapes” and represent auditory phenomena using abstract language in his paintings was particularly interesting to me. Aesthetically, Cullen Washington Jr’s material sensibility and way of making abstract, constructed works has long interested me. Additionally, his way of making and constructing as a metaphor for human connectedness is fascinating to me. Improvisation also plays a major role in the process of making this work. While I draw my initial inspiration from my relationship with trauma and my surrounding landscape, my process begins by making a series of intuitive, totally improvised moves. In this sense, I make the images based on some ideas I have ahead of time, but just as much as that, I am responding to the improvised moments that occur by chance as another means of exercising my own vitality within the process. At the same time I began experimenting with improvisation in my work, a friend of mine, who is a classically trained percussionist, began experimenting with improvisation in her practice. Since we share many views on the relationship between improvisation and vitality, and the ways different art forms (in this case, visual art and music) can invigorate vitality in the senses, we decided to collaborate on a series of audio-visual works to see how pairing these sensory experiences together could enhance the impact of the work. We approached this by sharing a studio/practice space a few weeks each semester. While I make my collages, she and other invited guests make improvised music in response to the visual work and the sounds I make while working. We record these sessions, and remix them together. As a final step, we play the recordings through speaker drivers attached to the back of the collages. The speaker drivers play the tracks at the resonant frequencies of the collages, creating interference in the sound that is improvised and outside of our control. Our goal for combining the improvised tracks and the semi-improvised collages was to enhance the experience of the work by engaging both the auditory and visual systems. The collages in the show are almost totally improvised as well as the tracks that accompany them. Additionally, multiple speaker drivers were attached to each collage at random to create even more nuanced audio interference.